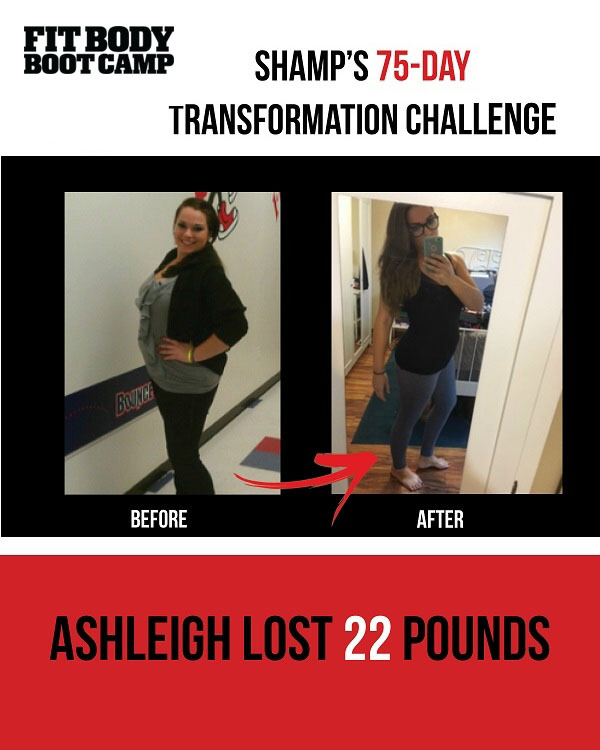 Ashleigh achieved fantastic results during the 2015 75-Day Holiday Transformation Challenge! Check out her essay below for some great inspiration. You can do it too! I was always fit and very active growing up and early into my teens. I was a competitive swimmer, on the water polo team as well as being on a travel soccer team. I loved sports, I loved being active! You never found me just sitting around. I was always that girl full of energy full of life doing crazy things and the center of the party. At age 19, fresh out of high school and into my first year of collage it all changed. I became a teen mother. This is where my story starts: the roller coaster of weight gain and depression. I had a healthy pregnancy, I did all the right things and worked out when I could (working 2 jobs and 14 hours days left little time for exercise). As healthy as I was I still managed to gain 55 lbs (oops). After my son was born my weight got out of control. I was a 20 year old single mother with a baby. I worked 3 jobs to support myself and my child. I made horrible food choices eating at whatever fast food place was closest and had the shortest drive-thru line before I had to be to my next job. My weight climbed to 220 lbs. I hated myself, how could I go from being active fit and healthy to a whopping 220 lbs? I was depressed. I shut down, I stopped talking to friends, I dreaded going out, God forbid I run into someone I new at a store I would avoid them at all possible cost. This went on for 4 years. I finally decided I needed to make a change. I needed to regain control of my life. I wanted to feel happy. I wanted to be healthy, and most importantly I wanted to live! I was too young to let life just pass me by. I stated working out. I lost some weight (woo hoo!) and I felt a spark in me that I hadn’t felt in quite some time. A few years had passed and after awhile I stopped working out and starting to fall back into old habits; eating fast food once turned into twice turned into three times and here goes the vicious cycle! I was unhappy once again, wanting to make a change but doing nothing about it. Finally I was introduced to the 6 week body transformation program (hallelujah) with Brien Shamp’s Fit Body Boot Camp. I remember walking in for my very first class not knowing what to expect, feeling insecure and intimidated. I thought people would look at me and judge me. I wished I could be invisible. But much to my surprise everyone was so friendly, so nice, so welcoming and so helpful! I have now been a part of the fit family for about 5 months! I have set goals and have been doing my best to reach it, I’ve had a few bumps in the road and haven’t always been on point with my eating and there have been days when I flat out just didn’t want to work out. Starting your program at 198 lbs I can happily say that today I am at the lowest weight I’ve been since getting pregnant (175 lbs). I’m not where I want to be but I am getting damn close! I have to say that if it wasn’t for the 75-day body transformation challenge pushing me I would probably still be half A**ing it, but once I started seeing changed in my body weight-wise and strength-wise and when people starting noticing I had lost weigh it pushed me to try even harder. I can’t wait to see where I go in 2016! But for once in a very long time I can say I am starting my New Years with a happy positive attitude.